Brendan played keyboard in various bands in his native North East of England, most famously with Lindisfarne for a spell in the 1990s. 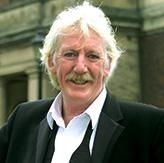 He became a presenter for Tyne Tees television, notably in the 1970s children's programme 'Razzmatazz', and was the composer of numerous signature tunes. As an actor in repertory theatre, he played every kind of role, from Shakespeare to comedy. He formed his own production company, MHM Entertainments, producing pantomime and musical theatre. He was also a fine comedian, much in demand as a speaker on the after dinner circuit.